Having been involved in both public sector and private projects looking at supporting independent living since the 1990s, the team here at Big Media are watching with interest as the debate rises again. In particular I’m referring here to the article in the Sunday Times about Whiteley Village published on the 19th February 2017. The article covers the quest for the secret of longer life, and how this English village retirement community in the Surrey stockbroker belt is being studied alongside communities in Japan, Greek islands and the Himalayas. 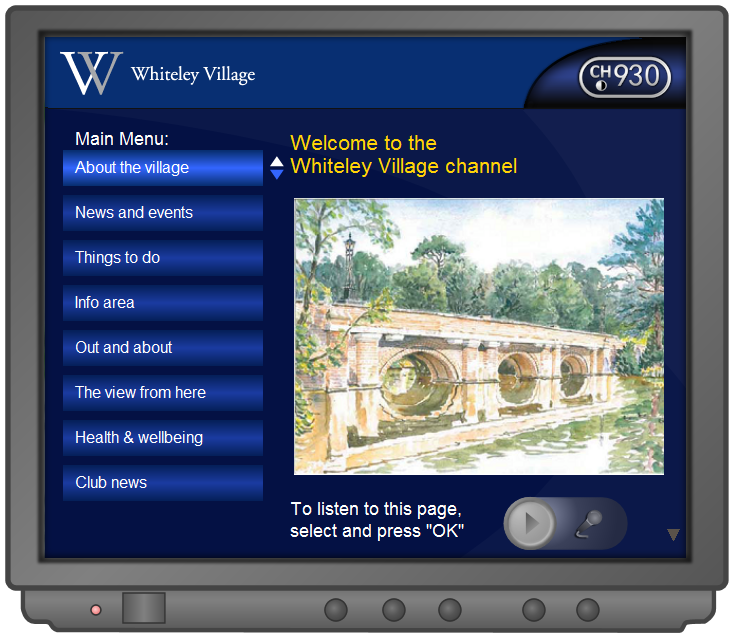 Apart from the encouragement from the Whiteley Homes Trust – who run the village – for residents to take control of their lives, and to interact socially as much as possible, it is also interesting to see that the whole village is to be wired up to become a “Smart Village”. The idea behind the Smart Village is to allow scientists from surrey University, and tech companies, to experiment with new ways of promoting good health and wellbeing. There is little doubt that much has been done to improve the interface and ease of use of many devices over recent years, including smartphones and tablets. This is good, especially when compared with the high hopes and subsequent failed realisations of tech service providers in the past when trying to encourage elderly users to adopt computers. The sheer complexity and number of buttons meant what these would-be new silver surfers actually had in their home was a £500 doorstop. As a team, Big Media’s foray into Interactive TV started in 2003, and explored many different aspects of using the TV to provide interactive services in support of Independent Living and care of the Elderly. “Why Interactive TV” I hear you ask? Well, cast your mind back to 2005, which is when our concept services were in full development. The announcement of the iPhone was still over a year into the future, and we were almost 3 years away from the first Android G1 smartphone. So what could possibly provide the means to encourage the use of the internet by people who were anti using computers? The TV was recognised as the only other viable, and importantly TRUSTED, screen device through which any kind of meaningful service could be delivered to a non-computer audience. And an overriding element behind this is that it was SIMPLE to use. I’ve included some links to concept videos we put together in 2008 that were working examples of the kind of ideas that could have a part to play in supporting Independent Living and care of the elderly, using Interactive Internet TV – apologies for the quality, something else that has advanced since we put these together!! Our work had the internet services available to users as another channel on the TV. Delivered using a Netgem iplayer hybrid digital TV / internet set-top box, these services were seen as an advanced teletext. Pages could overlay or embed live TV, or could be viewed completely separately. The main difficulty we faced back in 2009 – 2011 when we were testing the acceptance of the Companion channel at Whiteley was the lack of connectivity – a problem it seems will now be resolved. It will be interesting to keep an eye on how this latest iteration of ideas and experiments evolve. As time has passed, will more and more elderly users be comfortable with computers? Or will simple services on intuitive devices be the order of the day? Either way, perhaps alongside smartphones and tablets, PCs and laptops, the TV might yet have a place.